Warm welcome to the new currents visor in the press! After the recent launch of the real-time currents visor and the inclusion of a link in the Campus do Mar web page, the press covered this new. Here you have the links. 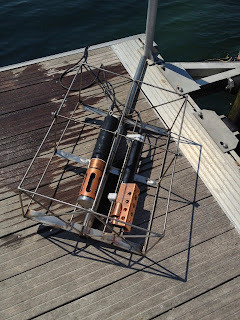 This system, implemented by Physical Oceanography Group of the University of Vigo (GOFUVI) in collaboration with Qualitas Remos, and installed in the Estación de Ciencias Mariñas de Toralla (ECIMAT) and in a lighthouse of the Autoridad Portuaria de Vigo (APV), provide a map with the average surface current values every 30 minutes and with an spatial resolution of 190 m, being available both the last data acquired as this from the last 15 days. By clicking on the map, you will obtain the numerical value of the current speed and direction in each area (keep in mind that the time showed is UTC, so you will have to sum one hour in winter and two in summer to obtain local time). News keep coming! This time a bit more technical than usual. We have just included two new probes packed with many sensors. Most of them are for scientific use (dissolved oxygen, chlorophyl , pH, salinity, etc) but the data are publicly available anyway in the science section at torallamar.info. 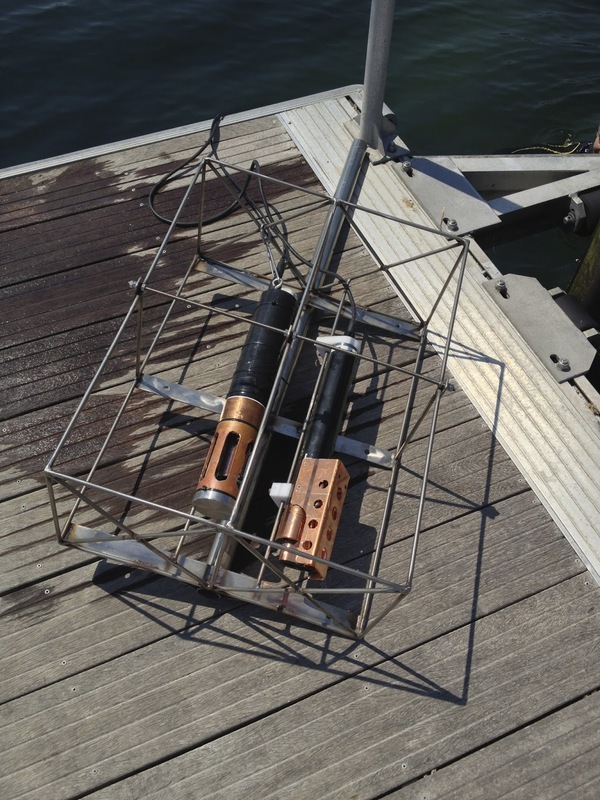 A new temperature probe located at 1.5m depth. A turbidity sensor that will help in having an idea of the underwater visibility. We are using a visibility scale according to other places and will appreciate any feedback about the visibility conditions that you may find in the are together with the date and time. This way we can build a better scale for the site. Both measurements are available in the "professional/sports" section at torallamar.info and in the science section. In the general page we will keep the temperature measured at 0.5m because is the one that affects to beach users. By popular request, we have added an icon to torallamar.info that leads directly to the Vao Webcam. Thank you very much to everyone for your suggestions, advice and for writing in general. Your messages are really motivating. Noelia Otero interviews us on September 2, 2013 in "Vigo Hoy por Hoy" at Radio Vigo-Cadena Ser about the service acceptance and future plans. Noelia Otero interviews us on August 7, 2013 in "Vigo Hoy por Hoy" at Radio Vigo-Cadena Ser and asks about torallamar.info. Tacho Jiménez, Jesús Núñez and Begoña Fontenla interview us about Torallamar for "A Revista" in Television de Galicia on August 6, 2013. Antía Diaz interviews us in "Galicia Despierta" (Radio Voz) about the Toralla oceanographic observatory station. Headline: Toralla starts its own oceanographic observatory. We received this morning in our suggestion box a request to add wind direction in degrees for those who practice nautical sports. Well, wish granted. Now, in the sports/professional section of the web and when you consult the wind in knots in the mobile version also have that information. Torallamar has a blog now! Welcome to the torallamar.info blog!